I have a feeling that a documentary about the real dolphin named Winter would have been far more interesting to watch than Dolphin Tale. Every emotion in the melodrama seems force-fed to the audience, like the outlandishly bad CGI animation which pushes the film based on a true story so that it has an artificial feel to it. This still may be adequate entertainment for younger audience members, but the poor filmmaking is transparent to anyone seasoned enough to recognize Hollywood manipulation. The title Dolphin Tale is a play on words, because this film is about the amazing true story of a dolphin with a prosthetic tail built for him after having his own amputated to save his life. In the film Winter is found by a young boy who is somewhat of a loner. Instead of spending his days in summer school, the young boy named Sawyer sneaks into the marine hospital where the dolphin is staying. The marine biologist (Harry Connick, Jr.) allows him to stay because of the bond he shares with Winter. His mother (Ashley Judd) is concerned by the amount of time he spends with the dolphin until she sees how active Sawyer has become. The story doesn’t stay happy for long, however. Even when Winter heals and survives with her own way of swimming, even without a tail, the damage threatens her life if she can’t swim the way a dolphin is meant to. Enlisting a brilliant prosthetist (Morgan Freeman), the team sets out on a mission to build a tail for Winter. The result is a sappy and predictable conclusion, with the documentary footage of the real Winter during the credit scroll being far more effective. The Blu-ray combo pack is teeming with special features, including a DVD and an Ultraviolet Digital Copy of the feature film. There is also a deleted scene, gag reel and five featurettes. Two of the features are animated shorts, one about the pig in the film and another about the Hutash Rainbow Bridge. 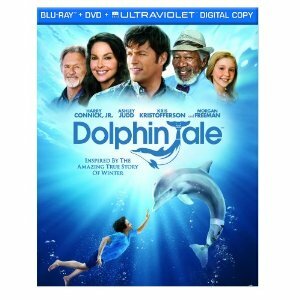 There is also a featurette about the real Dolphin Tale, a special effects feature and one about the home place of Winter.